New Delhi: Growing up in a village near Halda in Bangladesh—a tidal river that’s a natural spawning grounds for carps (rui, katla, mrigel, etc. )—the riverscape and its unique community that makes a living from fish eggs always captivated Manzoorul Kibria. Halda flows from Bangladesh’s southeastern uplands of Batnatali in Khagrachari district (formerly Chittagong Hill Tracts) and discharges into the Karnaphuli river. The 98km-long river has a turbulent tributary in Dhurung, which joins it 48km downstream from the source. During his research on the riparian ecosystem, Kibria found human interventions such as cutting out of ox-bow lakes, illegal quarrying of sand from the river bed, industrial pollution, unplanned construction of sluice gates for irrigation and indiscriminate killing of brood fishes posed a serious threat to the river’s biodiversity. A rapid rise in these factors meant the river, once a haven for brood fishes for releasing their eggs, turned unfriendly in recent years, leading to a drastic fall in the availability of eggs and fry as the fish migration diminished. Kibria decided to campaign to preserve Halda’s ecosystem by building a website (www.haldariver.org) that pointed to the importance of the river’s role as a gene bank of Indian carps at a time when excessive artificial breeding of the popular fish varieties was leading to dwarfism and malformed stock. The breeding grounds are also the source of livelihood for a unique community of people who have developed indigenous technologies to collect carp egg and hatch fry in shallow mud pits on the river bank. Although the website project was a personal initiative, small and self-funded to start with, it received enthusiastic feedback. “Later on, I have got tremendous support from the aware section of the society," said Kibria. “Through this website, I was (also) successful in uniting the community towards working together for the conservation of the river." 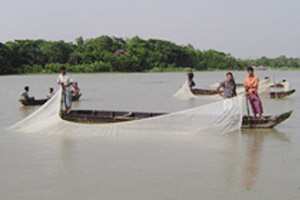 The fishermen community make a “significant contribution to the local and national economy" of Bangladesh, he said. The campaign to conserve the Halda ecosystem and the community it supports has attracted national attention. “You can see the reflection of that in the fact that the government of Bangladesh has started the process of declaring Halda River as ‘National Natural Fish Spawning Heritage of Bangladesh’," said Kibria. This was not an insignificant achievement for a project of such a small scale. Kibria said a big reason behind improper development along the river was a lack of reliable information on the river easily accessible from anywhere, which the website strives to address. “Halda river has not been studied from all the different aspects, and I would like to work together with researchers of different backgrounds to understand the river better and share that through my website," Kibria said. He has already set up a study group in the varsity that comprises a diverse set of researchers in environmental and marine sciences, geography, history, law and media studies.